I've always been a bread lover. In my book, nothing beats warm bread fresh out of the oven with some butter on top. If like me you like good bread and you ever are in Hong Kong, please stop by this Italian restaurant called Fat Angelo's. The food is phenomenal, but their bread basket is out of this world. I consider their bread, the best I've had till date, ever. On to my experience baking bread from scratch. In the past, using yeast overwhelmed me. I tried my hand at bread a few times a couple of years ago and each time ended up with blobs of unrisen dough resulting in brick hard bread, no, you could definitely not call that bread. Later on I learned that I wasn't doing anything wrong. Infact, I was using a brand of yeast that was known to fail; only I didn't know that. So if any of you reading this are based in India and have tried baking bread using Bluebird yeast, without much success, you know why. Please change your brand of yeast. This Crusty Italian Bread is something I am so proud of. Once you get the hang of making bread, its actually a lot of fun and very satisfying to see a beautiful loaf emerge from the oven. The flavor and texture was fantastic. My husband isn't overly fond of bread, but he went back for seconds. He liked this bread so much that he had a slice after dinner with some butter. I was elated. I knew that I had done something right. I can't wait to make this again. Mix in the yeast, salt and sugar. Add the oil and the water and mix it well till the dough comes together. Turn the dough out onto a lightly floured surface and knead the dough well. Add more flour gradually if the dough is too sticky. Knead the dough for about 7 minutes. The dough should be well knead, soft and not tacky or sticky. Smooth it out into a ball and place in an oiled bowl and cover with cling film. Keep the bowl in a warm place for about 60 minutes or until double in size. Remove the cling film and punch the dough back to knock out the air. Turn the dough out onto a lightly floured surface and flatten the dough with your hands. Roll it to form an oval shape. It should be rolled tightly and press the seam well. Repeat the process again. You should end up with an oval loaf with slightly tapered ends. Place it onto a lightly floured board and cover loosely with a clean tea towel and leave to rise for 30 minutes. Preheat the oven and your baking tray to 220°C. When the dough is ready to be baked, remove the tray from the oven, sprinkle some semolina and place the loaf of bread over it, to add some crunch to the base. Using a sharp knife, make a couple of slits on the top of the loaf about 1-2cm deep. Spray the loaf with water and place it in the oven for 3 minutes. Repeat this step 2 more times, leaving the dough to bake for about 40 minutes after the last spray. If you think the bread is browning a little to much or too quickly, place some aluminium foil loosely on top. When the bread is done, take it out of the oven, turn over and tap the base of the loaf. If it sounds hollow, the bread is done. Leave the bread on a cooling rack. Once it has cooled, slice and enjoy!!! 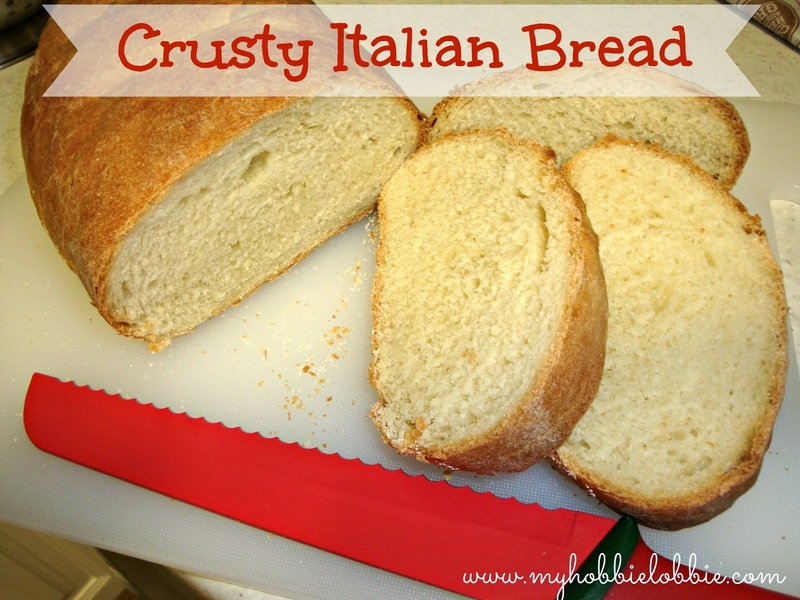 I love Italian bread and trying new recipes. Can't wait to try this one. I hope you enjoy it as much as we did. How have you been? I believe so, since I've not come across this step while making other types of bread. Really very Crusty post, As you describe in your post that stop to say Fat Angelo's to Italian restaurant, i am totally agree with you. For crusty bread lover it is a very nice and useful post. Thanks for sharing such a nice recipe.